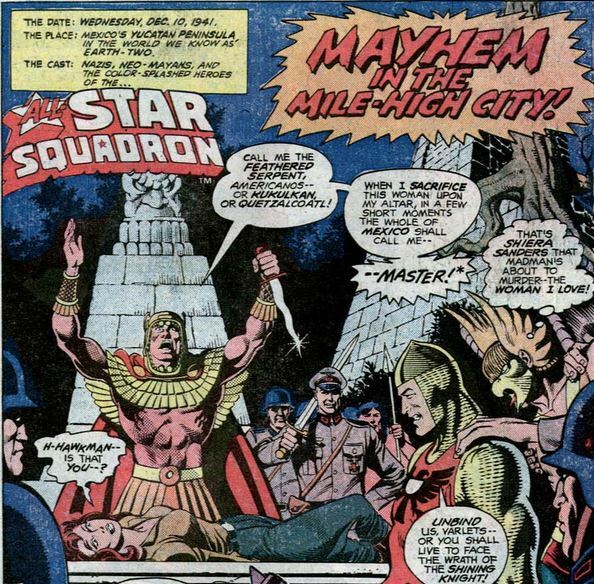 I'm thinking: How could a bunch of Nazis restrain the Shining Knight and Hawkman? The most obvious way is by threatening Sheira unless both heroes complied. The Shining Knight is consistent in that every time he finds himself in fetters he always - somewhat stupidly - demands to be loosed. It's like he half expects his opponents to do something so irrational. Maybe Sir Justin fully believes it, after all, he is a practitioner of the code of chivalry, a code of conduct so irrational that it expects soldiers to be celibate yet at the same time be devoted to an ideal female of their choice - thus always maintaining a constant state of sexual tension. Untenable at best. As Feathered Serpent is telling the story of how he became Feathered Serpent look who's name just popped up? Well, we have the Mexican version of the Klu Klux Klan. 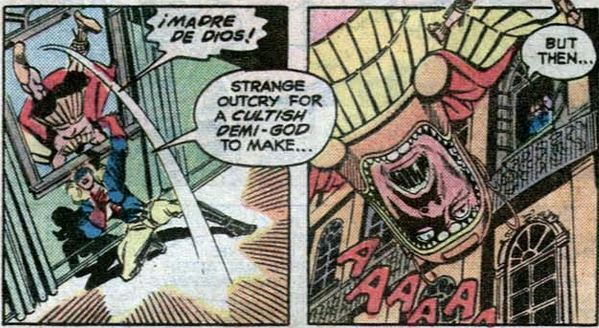 So the human sacrifice is being done to activate some kind of berserker rage among all the Mexican 'pure bloods'. Fortunately, Murphy's Law applies. First, Hawkgirl manages to loosen her leg fetters. 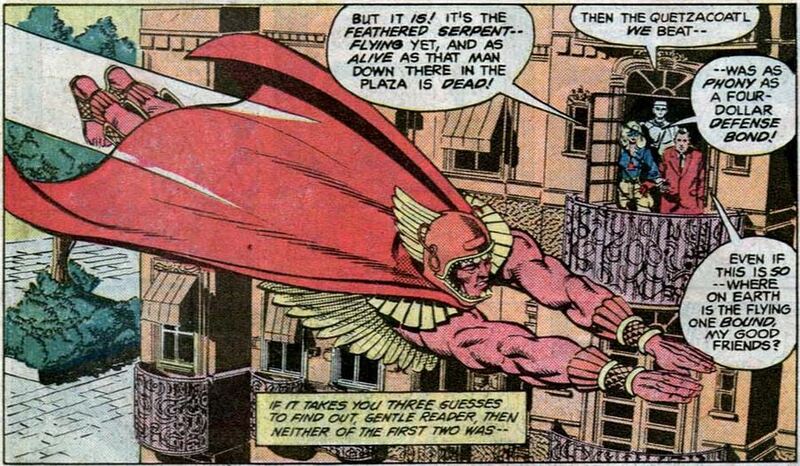 Hawkman escapes . . .
. . . freed by the Shining Knight. 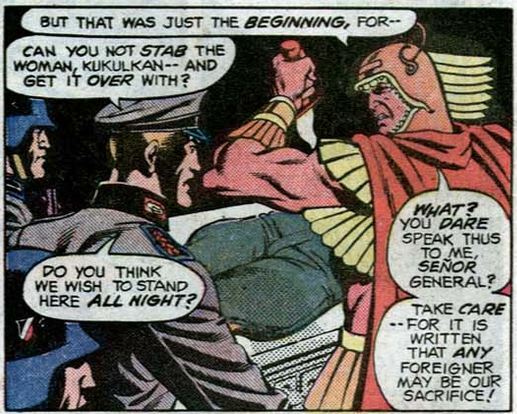 With his prisoner having escaped, and the window of time for the sacrifice closing fast, the Feathered Serpent decides to sacrifice the nearest foreigner, and that happens to be his ally the German general. 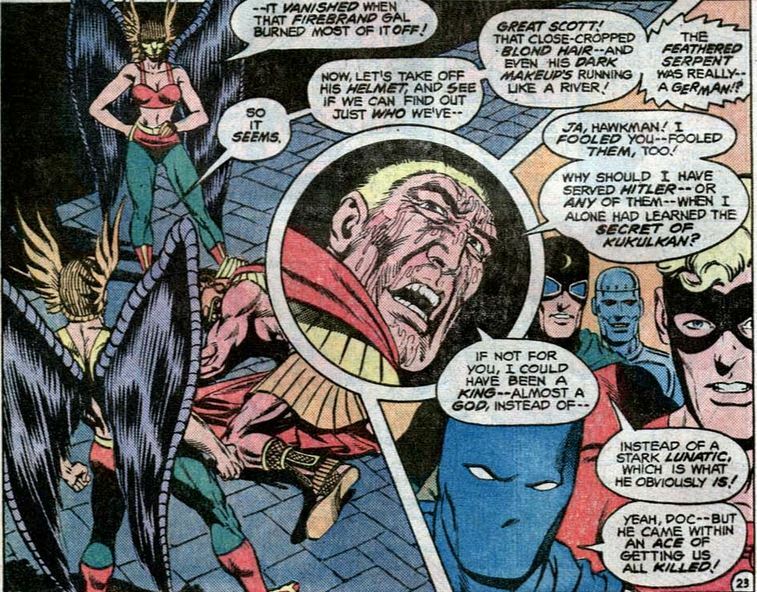 At last, Hawkgirl joins the fray. Feathered Serpent reveals that he's not just a colorful costume. 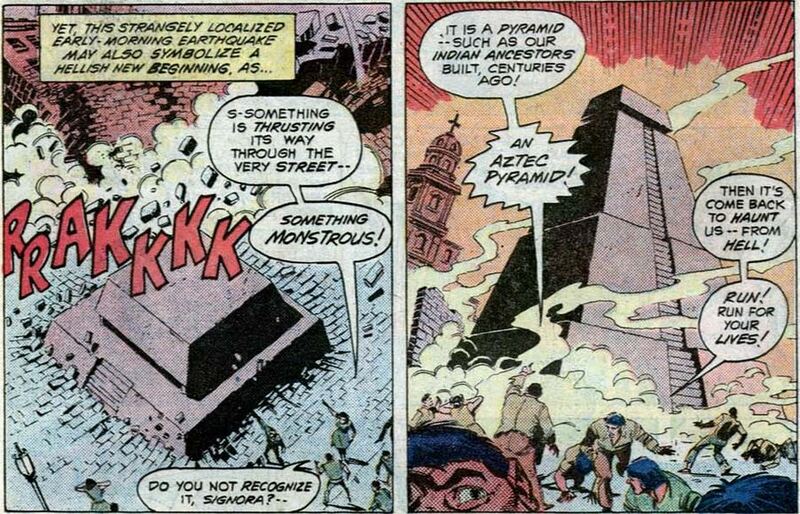 In Mexico City, an Aztec pyramid suddenly rises up from the ground. The mesmerized purebloods, armed with Nazi weapons, begin a slaughter in Mexico. The Squadron does what it can. 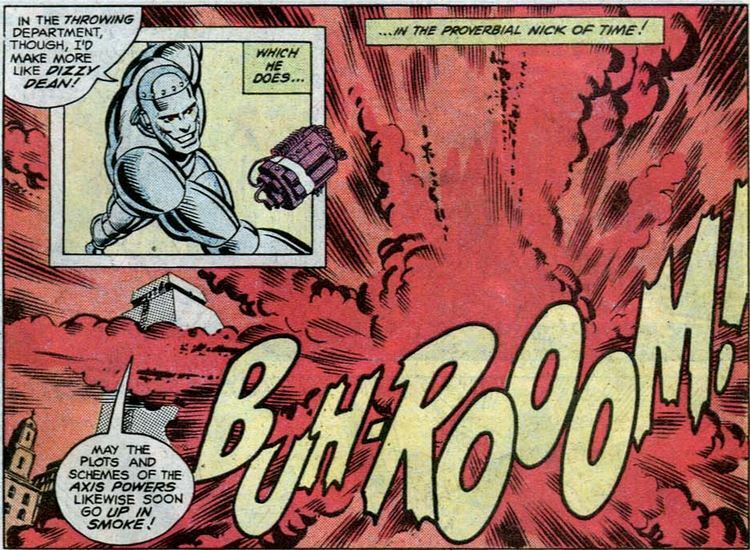 I specially like Johnny Quick's instant wall. 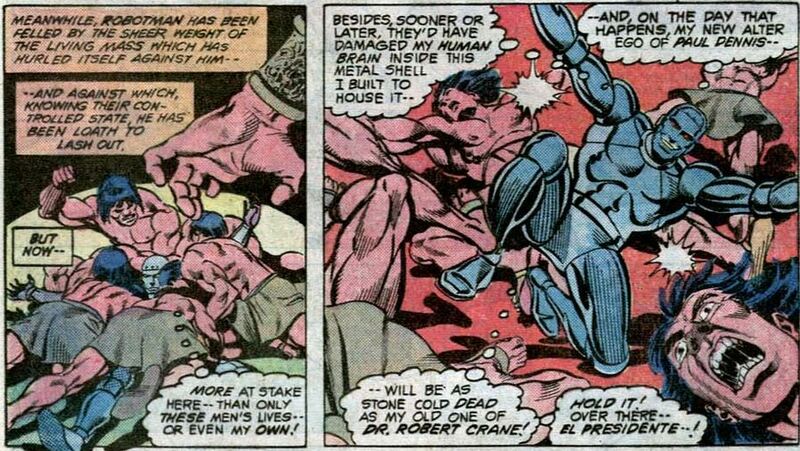 For the nth time the Atom is complaining about not having powers, it's been across several issues now - Al Pratt is beginning to sound a bit whiny. Beautifully rendered National Palace of Mexico. 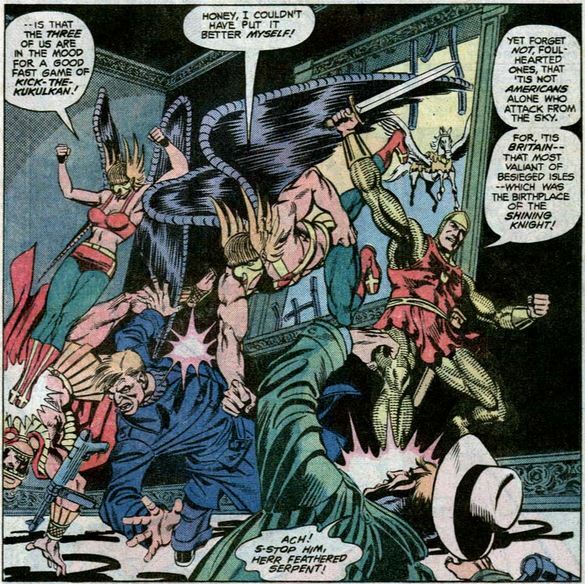 It comes under attack from the Feathered Serpent. 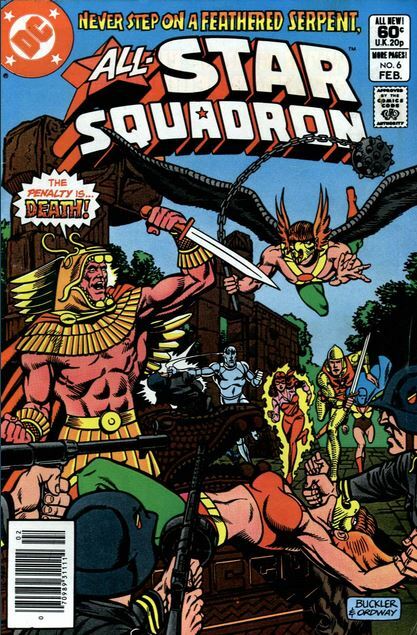 Some of the Squadron are there to defend the President. I like Liberty Belle but this adrenal power is a bit forced. What is this 'adrenal' power? Some kind of sonically activated ability maybe. Robotman is also here for the defense. I told you I liked Liberty Belle. She's the one who stops Feathered Serpent. Just as the All-Stars are about to celebrate, they look out the window and realize that the Feathered Serpent they beat was not the real Feathered Serpent - it was a proxy with an exoskeleton. Meanwhile, the airborne All-Stars take the fight to the enemy. 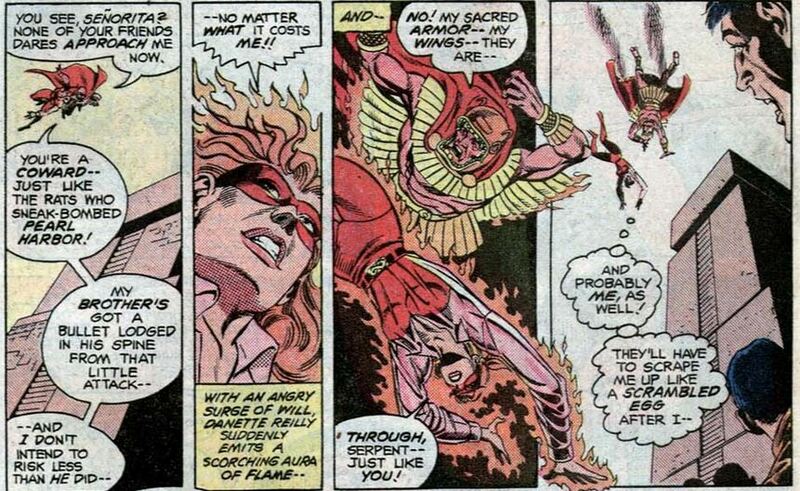 Feathered Serpent captures Firebrand but she soon becomes too hot to hold - literally. In the craziest twist of all, the Feathered Serpent - the Mexican racist - turns out to be a German! 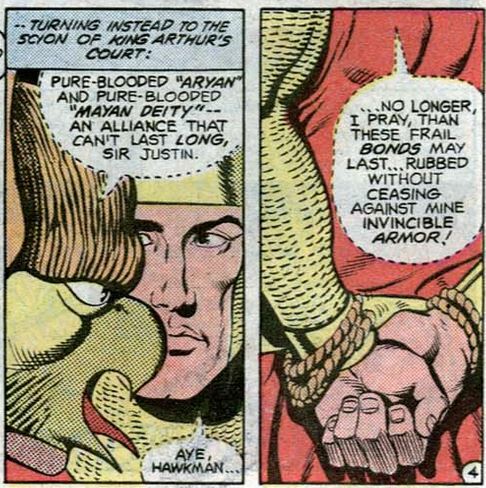 A last minute backup plan from this Nazi is handled by my favorite All-Star duo: Johnny Quick and Robotman.